There was an article printed recently in a large magazine which evaluated the desks of some well-known people who had “less than neat” desks. Among them were many successful heads of corporations and scientists, such as Albert Einstein and Steve Jobs! If your child is not organized, it doesn’t mean he or she will be successful, but it makes it harder to meet deadlines, stay on top of upcoming projects and have a general sense of where to keep things. If you want to teach your kids important organizational habits so they will not be quite as “organizationally challenged” as the people mentioned above, here are some practical tips you can teach your children to help with their organizational issues. Purchase organizer furniture that offers multiple drawer options to house their most important tools and items. Some of these come in three or four-drawer units and usually made of either hard plastic or cloth of some type. They can be very decorative and are made to match the colors of your décor. Put up a “work schedule” for kids, which includes periodic organizing of their room and work areas. This will keep their area free of clutter and keep it functional for their schoolwork and other projects. Model good clean up habits. When you are involved in a project, make sure and model behaviors you want to encourage in kids, such as cleaning up and putting away all items in their proper place so that they can be easily found again. Reward kids for keeping things in order by buying them something they want for their room. Sometimes, a little reinforcement is what is needed to encourage good behaviors. Make sure your child has a specific place for their schoolwork, which is located close to their computer, paper and other tools they need to do the best job possible. Much of organization involves time management, which we discussed in a previous post. Time management involves the skillful managing of time and it is just as important as knowing where everything is. To help your child learn to manage his or her time more efficiently, try these tips. Have them make a weekly schedule they can stick to, and delegate certain time slots to specific tasks, such as homework, chores and social time. Make sure and include fun things, such as social time so that they feel they are getting a few breaks in between the work. Purchase an organizer to keep up with their homework, “things to do” lists, and special projects. Reward them for writing down and doing the most important tasks first. Most of effective time management is knowing what to do when and prioritizing so that the most important stuff is completed first. Gamify organization. Companies use “gamification” to increase productivity at work. Google started much of this movement by integrating rewarding, fun activities within their workday for employees, and by offering many benefits to keep them motivated. You can gamify your child’s organizational challenges by making it fun. Give rewards for completed tasks at first. Behaviorists tell us that a behavior that is rewarded will be repeated. If you reward behaviors regarding organization often at first, such as doing chores on time, finishing homework and other tasks, they will be more likely to continue these behaviors. It is important, however, to not continuously reward from now on. Eventually, you should lower the amount of tangible reward you give kids to reinforce a behavior and let the behavior (or the result of the behavior) be a reward itself. This way they will begin to understand why it is important to be organized: not for some tangible reward, but because it brings more order or productivity to their lives. Talk to teachers at school about helping with organization at school. Teachers like kids to be organized. It cuts down on missed assignments and lost work. Most teachers would be happy to work with you on some ideas that will help coordinate your child’s organizational skills to help both at school and at home. 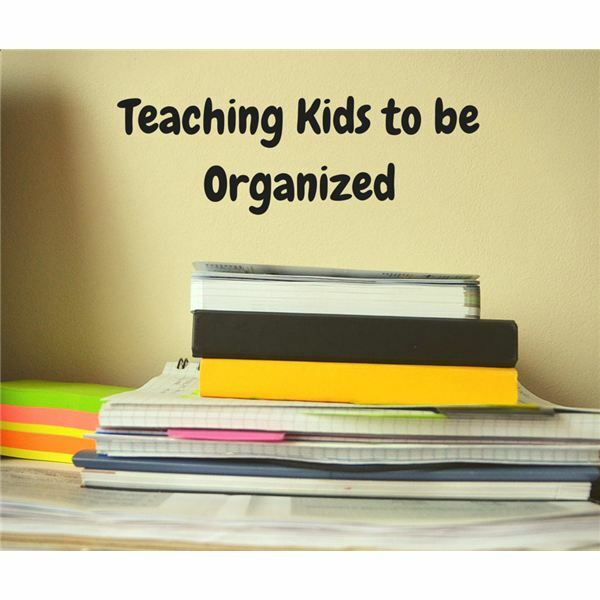 To teach kids to organize, employ the use of rewards to reinforce behaviors you want to continue, implement a plan to keep up with work, keep your child’s room organized to encourage order when working on school assignments and have specific times for tasks. Together, these ideas should help guide your child in the right way toward better organization, which is a skill they will need all of their life.